EXTREME avalanche danger: Monday is a NO-GO! Unique situation in the Alps: snow cover of 450 cm! What a difference compared to the last three seasons! There pretty much has been a storm almost every week in the Alps since the beginning of November and the snow cover has grown really fast in the northwest and north of the Alps since the last week of December. There is a snow cover of around 200-350 cm at an altitude of 2000 meters, with outliers towards 450 cm at the measuring station from the Swiss resort of Les Marécottes. An absolute record. Normally there is about 170 cm of snow at this measuring station at this time of year, while the maximum thickness ever measured here was 427 cm. Now that's record breaking snowfall. And there will be more records that will be broken today. It's snowing heavily again in the northern French Alps and the west of Switzerland since Sunday evening with locally already 50-80 cm of fresh snow in the past 24 hours. About 8 meters of snow came down in these regions since the beginning of the winter. because snow consists for 90% out of air, the snow cover settles itself under the influence of temperature, wind and its own weight (check out this article). We have not seen this much snow in the Alps since the 'avalanche winter of 1999' and in some places the snow cover is already thicker than it was at the end of February. Warmer air is arriving in the Alps right now and I expect the warm air to arrive in the west of Austria by noon. The freezing level will temporarily rise to 2100 meters in the French Alps and the west of Switzerland and to about 1800 meters in the west of Austria and about 1500 meters in the eastern Alps. The snow line will rise towards the 2000 meters in the west of the Alps during the day, towards 1500 meters in the west of Austria and towards the 1200 meters in the eastern Alps. You can expect rain and wet snow below these altitudes. These rising temperatures will result in a heavier snow cover and that will make the situation even more critical. Huge amounts of fresh snow and the rising temperature result in an EXTREME avalanche danger (5 on a scale of 5) in parts of the French Alps, Switzerland and Tyrol in Austria. This is a very special situation that has not occurred since 1999 on this scale. The diagram above shows what EXTREME avalanche danger actually means. It has huge consequences for roads, trains, building and other vital infrastructure. Due to the emergency situation, chalets in the Swiss resorts of Evolène and Les Marécottes have already been evacuated as a precautionary measure, a lot of roads have been closed to prevent avalanches from crashing into passing traffic and thus cutting off many ski resorts. Due to the extreme avalanche danger, a lot of ski areas will remain closed today. A weak cold front enters the Alps in the night to Tuesday. It will be temporarily colder with some last snowfall. This drop in temperature will temporarily result in a stabilizing snow cover, but that won't last very long. Milder air will be flowing into the Alps on Tuesday afternoon. The mild but dry air is sent to the Alps with a southwestern current. This will result in Föhn wind on the north side of the main alpine ridge and the freezing level will rise. The freezing level will rise towards 2700 meters in the western Alps and about 2200 meters in the eastern Alps on Wednesday. Because the air is pretty dry, this will have no consequences on shady faces, but it should be taken into account that the snow cover on sunny slopes might become very unstable during the day, which can have consequences for the opening of roads and ski areas because of the enormous snow cover. The nights are fortunately clear and cold and that gives the snow cover a chance to stabilize again. The Alps will have to deal with mild, but dry air till Thursday. It is expected that ski areas will slowly return to their normal rhythm on Tuesday/Wednesday. You can ride great snow on the slopes, but don't think about going off-piste. The situation remains critical. Fortunately, the snow cover will soon settle itself this week and the critical situation will soon improve. A new storm will come in at the end of this week. This storm will bring snow to the northwest of the Alps with powder days on Friday and Saturday. PowderAlert # 12 is already on the radar. A point of attention for this weekend are the warmer temperatures that might come in on Sunday. In short: be patient, Friday and Saturday might be powder days. PS: if you're in the Alps right now, post your status below. wePowder Pro members: thanks for your support!! We have introduced wePowder Pro this winter. You'll get extra weather and terrain data for € 25,08 per year (you can not even buy a day pass for that amount in many places). This allows us to further expand our service and we have found a way to express your support to us. Many of the readers of wePowder have done that already and the whole wePowder team and myself are grateful for that. This allows us to keep on developing to make our service even better. Thank you very much! Are you not a wePowder Pro yet, but do you regularly read the weather forecast or use the services on wePowder? With an upgrade to wePowder Pro you support us, you can express your gratitude and you'll ride more powder. And it works great for your karma as well. Thanks! Oh, and you'll get a free 7-day trial when you register yourself on wePowder. No strings attached! Many lifts (actually most of the area) are closed as well, ski buses and taxis not operating (at least the case on Sunday). But the off-piste skiing has been incredible. I have never hit so much powder in the 4 days we where there. 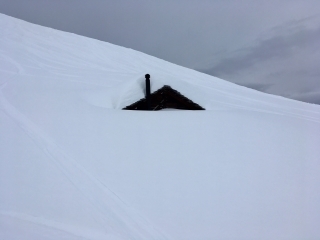 However watch the avalanche situations and stay safe! Verbier (Bruson) on Saturday. Did not venture out yesterday. Stay Safe out there... and Morris... spot on with forecast!!! I have no special knowledge but I would imagine they'll have a fair number of lifts running tomorrow, especially serving some of the lower slopes. I'm in Livigno and tree skiing is fantastic. However, most of the lifts on top are closed. Yesterday only the main Mottolino lift was open, and on the Carosello 3000 side you haven't been able to go higher than Costaccia. At Livigno now, absolutely fab conditions looking forward, but today was excellent snow on slopes and in the immediate off-piste, radical no-go elsewhere, snow cover far too unstable (80+30cm in the last two days) with heavy winds today that created massive wind lips. Still, snow was falling at -7 thus pretty iced and powdery..check next two days for the snow pack to stabilize and enjoy some - carefully selected and never without the right equipment and experience -great free ride!! Snow cover development in Crans-Montana @1650m between Tuesday night and Monday morning. Had some 4 days of awesome deep powder in the trees, yesterday everything closed and raining.